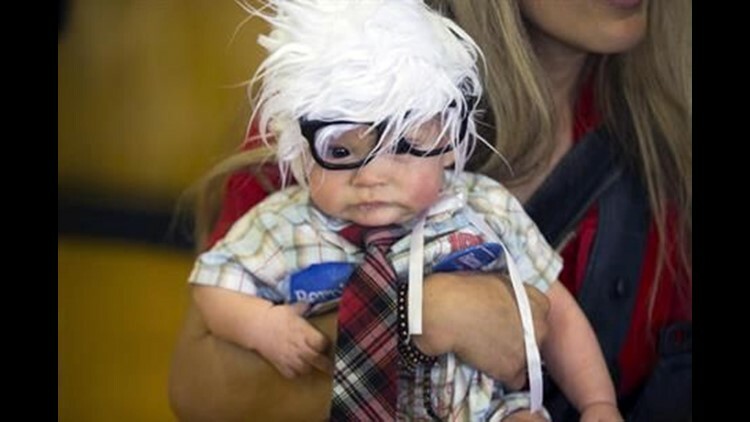 LOS ANGELES (AP) — Bernie Baby, the cheerful infant who won the affections of people of all political stripes after his mom posted photos on social media of him greeting Democratic presidential candidate Bernie Sanders in a lookalike white-haired wig, oversized glasses and plaid tie, has died of Sudden Infant Death Syndrome. Oliver Jack Carter Lomas-Davis of Los Angeles died Feb. 25, his aunt Anastasia Lomas told The Associated Press. He was 4 months old. In his Bernie Baby photos as well as most others, Oliver is often smiling broadly, although in a few of the Bernie lookalike pics he has nodded off. In one he's enjoying a baby bottle. In still other photos, he's just being Oliver, out for a stroll with his mom or a visit to the store. Sanders spokesman Michael Briggs said the candidate had been told of Oliver's passing and the campaign planned to issue a statement. "It's very sad," Briggs added. Oliver's mother was too distraught to talk Thursday, her sister said, but she was encouraging everyone who had been captivated by her son's brief social media fame to celebrate his life. "I love you dearly, I love you most. I love you with all my heart and soul. I know that God will keep you near since God and truth are here," she said in a posting on her Facebook page.